Pressurestats sense of pressure and the use of pressure variations for systems management. Two versions of the bellows type and Bourdon tube type. In bellows type, shown here, is connected directly to the cooling cycle through the capillary tube. As the pressure in the system changes, the pressure in the skins too. 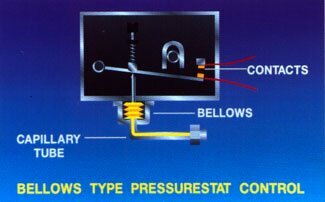 Bellows stretches with increasing pressure and removed from the pressure drop. It makes or breaks the circuit, how to open or close contacts, respectively. Because it sends electrical signals, electric control. However, pneumatic and electronic version pressurestats are also used. Contacts to make it as pressure increases and break as the pressure decreases. 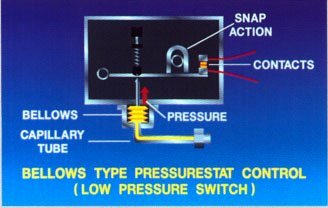 The example is the low pressure switch. He shuts down the compressor and/or other system of the machine when the pressure falls below a certain point. Reversible contact scheme allows the device works as a pressure switch. High pressure switch opens the circuit and system shutdown, when exceeded the set pressure. When the pressure returns to normal, the system restarts. Because of its simplicity, reliability and flexibility, control is used on the majority of the air conditioning and refrigeration systems. It is used to protect the compressor against damage when the system pressure is too high or too low. 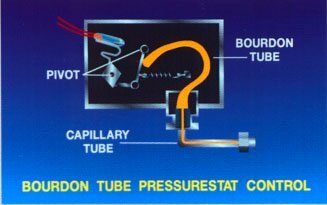 Here Bourdon tube pressurestat. Bourdon tube flat metal tube, sealed at one end. As bellows his senses, and is actuated by pressure. Example an electric control because it sends an electrical signal. This pressurestat has a mercury lamp switch is similar to the one used on some thermostats. 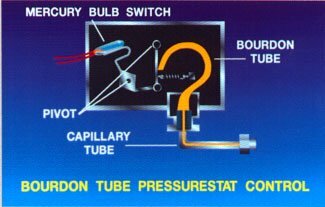 In fact, Bourdon tube pressurestat ideal for mercury lamp design. It is often used in applications requiring closed contacts.